A pioneering head teacher who turned around the fortunes of a failing inner-city school has been awarded a knighthood for services to education. Under the leadership of Dexter Hutt, the number of pupils getting five A* to C GCSEs at Ninestiles School, Birmingham, rose more than tenfold. Mr Hutt now has control of two schools, in an effort to improve overall academic results in the area. The second - Waverley Secondary - trebled its GCSE pass rate this summer. Mike Yarnold, assistant director of education in Birmingham, said: "I am delighted at the news. 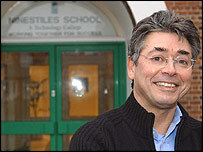 Dexter Hutt is a really excellent head teacher and Ninestiles is a very successful school. "Dexter has provided strong leadership and support and I am pleased that his achievements, and those of his school, have been recognised in this way." Under reforms brought in by the 2002 Education Act, Mr Hutt was chosen to run one of four "hard federations" of schools set up in England. The scheme was seen as an alternative to the government's policy of closing failing schools and reopening them under new heads. Mr Hutt became the overarching head teacher of both Ninestiles and nearby Waverley. This summer saw the number of pupils who gained five or more GCSE A* to C grades at the latter more than treble to 49%. The rate for Ninestiles, which has become a City Technology College, was 74%, well above the national average. At one stage in the 1980s it was just 6%. After he joined the school, Mr Hutt introduced a strict behaviour code. Pupils and teachers laid down a new set of rules together to promote mutual trust. Mr Hutt has more recently been critical of "laddish culture", which he blames for holding back boys' achievement. He once told BBC News Online: "The main reason for this is the culture of football that we have. "A lot of lads are watching a lot of football during the week. "I would guess that many boys are spending hours and hours playing Championship Manager on the computer and becoming real experts and it's time that would be better spent on their GCSEs." Mr Hutt is one of several figures from the world of education to be honoured. Bernard O'Connell, principal of Runshaw College in South Ribble, Lancashire, is also knighted, for services to further education. Alexandra Burslem, vice-chancellor of Manchester Metropolitan University, receives a damehood. Meanwhile, Jennifer Chart, head teacher of Portland School, Sunderland, gets a CBE for services to special needs education. David William, former chief executive of the Association of Colleges, receives the same honour for services to education. The same is true for Professor Charles Desforges, emeritus professor of education at Exeter University.